What is the story behind the founding of Eizer L'Shabbos? Eizer L'Shabbos started around 15 years ago when I lived in the United States. My beloved friends Rabbi Tukatzinsky and Rabbi Trenk told me the situation and poverty of Tzefat where dozens of families without basic food products. Once I moved to Tzefat with my family ten years ago, I saw the dire situation with my own eyes and decided to get into it full force. As Tzefat's religious population increased, we started giving to more families. A few years ago, we saw the need to sponsor families in order that these families should receive food on a steady basis. Today, we have 20 sponsors and need many more sponsors since most families only receive Eizer L'Shabbos food packages every other week, every third week, monthly, or for holidays. The more I get into it the more I see the need for this organization. Commenting on a past posting about this organization, Rabbi Dovid Sears wrote, "Eizer L'Shabbos really does what it claims to do. This is such a chashuvah tzedakah -- I can't recommend it highly enough!" Click here to watch a new video about this organization. Never heard of it thanks for the info. Socialworker/frustrated work: I encourage everyone to try to give something to help them out. i've been supporting RBR for a while and sukos he took me on a tour of the operation, this tzedaka is of the highest caliber and worthy of our help. Amshinover: Thank you for your words of endorsement. My name is Yisroel. i have known Rabbi Rosenberg for about 20 years. our family has been involved with the organization for many years. As amshi said, this tzedeka is of the highest caliber !! A few years ago, i stayed over at his home for shabbos. 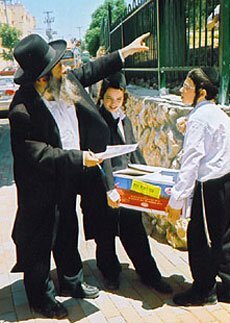 I can testify that he cannot walk 10 feet in tzfas without someone coming over and bless him for all the chesed he has done and is constantly doing. He helps jews from all backgrounds and is the most non-judgmental chasidishe jew i have ever met. Simple Jew, thank you for advertising his tzedka on your site. Yisroel: Thank YOU for telling us more about Eizer L'Shabbos. Yitz: Rabbi Rosenberg just left a message for me regarding your comment. He said that he prefers that donations be sent to the U.S. address since they are deposited into his account immediately are tax-deductible (while those deposited in Israel are not). Well thanks I will have to look into it.